Today, I’m completely completed. I did the TRX 200K workout followed by 10 sets of 100 jump ropes and 10 burpees. I took Pat Flynn’s advice and worked out in a fasted state by not eating breakfast. I weighted 180.6lb before the morning workout and 179.3lb after. I also measure my body fat and lost 0.5% down to 20.5%. Not bad since earlier at the start of the week I was at 21.1% BF. Just wrapped up my evening workout. I’m training for fat loss and got to keep my calorie intake low. Going to drink my protein shake with raw egg and 2-3 hours later have my casein protein shake with raw egg. 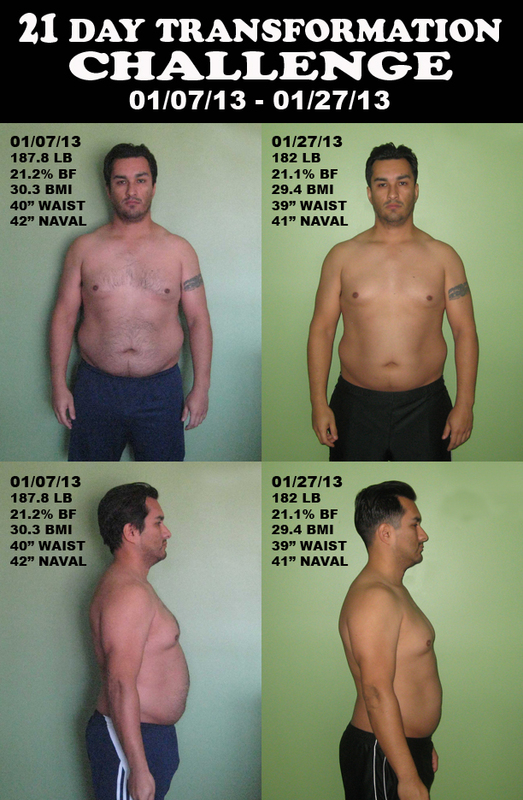 After completing my 21 Day Transformation Challenge I was left wondering what program to do next. Honestly, I still don’t know but decided to go back to a program I did last fall, The Skogg System. Today I did Roots 4 which is 6 exercises of 4 sets each for 30 sec each side/arm with a minute rest between exercises. So I did swings, cleans, clean and presses, squats, high pulls and snatches. 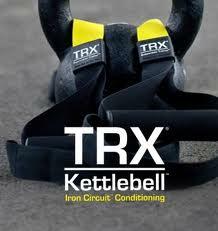 Tomorrow I’ll do a TRX workout in the morning with kettlebell workout in the evening. Sometimes I feel I can do a little more and feel guilty when I don’t. Can’t get beasted that way. I’ve wrapped up the 21 Day Transformation Challenge today. Although I was short of my goal of losing 10 pounds, I’ve lost 5.8 lbs and an inch around my mid section. My body fat barely moved and I’m wondering if those 5.8 lbs that I lost was muscle and/or water. I knew going in that not much results can be had in as little as three weeks but I feel I got a good start. I got some momentum eating clean and learned some cool kb complexes along the way. I’m going to continue working out and eating clean and start a brand new 60 day challenge tomorrow. Today was suppose to be my rest day but decided that I needed to burn a little more. I’ve been itching to get back on the TRX Suspension Trainer and I tried the TRX 200,000 STRONG WORKOUT. 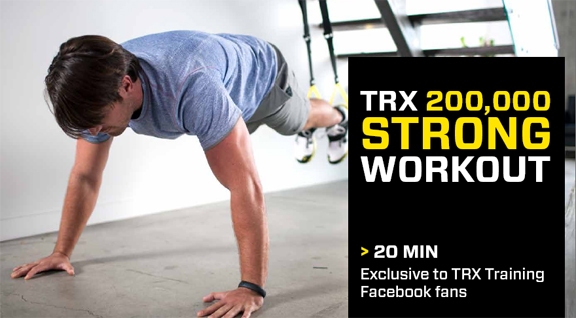 It was an exclusive workout for all the Facebook fans on the TRX fan page for reaching 200,000 likes. It was a 20 minute workout with 9 exercises, 20 reps each and 20 second rest in between. I wore my heart rate monitor and was able to complete the workout in 16:26 minutes and burned 207 calories. My body is still feeling the after burn even after completing the workout 15 minutes. Great way to rev up the EPOC engine. Tomorrow is a much needed rest day and my final weigh in for the 21 day transformation challenge. That’s it! I finished all 12 workout in the 21 day challenge. It officially ends in two days. I’m going to sneak another workout tomorrow so I can drop another pound and maybe get under 180 lb. I’ve lost a solid 5 pounds and my goal was 10 lbs. I’m going to do a TRX workout which I haven’t done in months. I’m still deciding my next workouts and schedule. I’m thinking about doing a 30 day or 60 day schedule. I did a warmup and 2 great kb complexes today. Try these out. These are NOT thrusters, which makes them considerably more challenging. Pause between the squat and the military press. Today’s workout was Pure Savagery. 2 different pain chains. 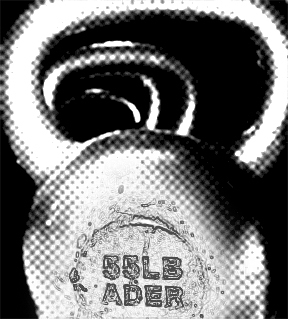 First one was a swinging pain chain that used three kettlebells—Medium, Heavy, and Heavier—in a row, put five minutes on the clock and perform 5 swings at each bell, moving through the line as many times as you can in the five minutes. Second was a press pain chain with a medium, heavy, and extra heavy bell. Line ‘em up and perform one military press at each bell. Cycle through the line-up as many times as possible in 10 minutes. Last but not least was “With all the Love in the World” complex. This complex is a definite keeper for future workouts. What I liked about this complex is that it works your upper and lower body in a short amount of time. Just one more workout to go! for the 21 Day Challenge. I’m finishing strong! Just 2 more workouts to go. Today’s workout was rather easy. 5 minute warmup then 5 sets for 5 reps of double kb front squats. The heaviest pair of bells I have are the 26 lbs. Then finished with 3 sets of leg raises. I’m going to be looking to get another 35 and 44 lb bell to get more of a burn. The good thing is that I’m getting stronger and need a bigger challenge with my current bells. I’m going to be thinking about my next workout that I want to do after this 21 day challenge. I’m thinking about TRX, kettlebell and jumprope hybrid.